It is no secret that I am a knife enthusiast, and I have probably used hundreds of different knives in my life (if not more). To me, a folding pocket knife is as essential to my daily loadout as my shoes, so I am never without a knife. I am here today to review one of my favorite EDC knives to date, the Benchmade 940 Osborne. This is another knife designed by the late great Warren Osborne, and it is about as close to perfect as a knife can be. It does have its flaws, of course, but these are minor enough to make the knife an excellent investment. Benchmade was founded way back in 1988, and has been producing the 940 for a little more than 14 years, and it has always been a strong seller. Benchmade has proven to be one of the best knife makers in the industry, and builds its knife to fantastic quality control standards from premium materials. They have developed a reputation for quality knives and they stand behind their products, which has made the Benchmade almost the Rolls Royce of pocket knives. The Benchmade 940 is built with a 3.4” modified reverse tanto blade, with a blade thickness of just 0.114”. The knife’s handle is 0.4” thick, and the knife has an overall length of 7.87” fully deployed. Stowed in your pocket closed, the knife is only 4.47” long and weighs a mere 2.9 ounces. That is almost feather-light, and the knife will literally disappear in your pocket! The blade on the 940 is made of S30V premium stainless steel, one of the best steels available. It sharpens relatively easily but holds an edge remarkably well; after weeks of heavy usage, my Benchmade 940 is still sharp enough to shave with. The handle is anodized 6061-T6 aluminum with stainless steel liners and a purple anodized titanium backspacer. Almost everything about this knife oozes beauty and function. Note this knife comes in a handful of different varieties, including a CPM-S30V premium stainless steel blade. 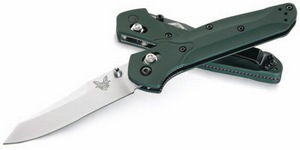 The Benchmade 943 model features a modified clip point blade. The only break in the beauty is the pocket clip. The pocket clip on this knife is black painted stainless steel, but to be perfectly honest, it is not well made. The paint chips off very easily; after just a few weeks of carry, I noticed the black paint had chipped off the edges of the pocket clip and the bare stainless steel was showing through. I’ve seen some limited edition models of the 940 use the Parkerized split-arrow pocket clip that other Benchmade knives come with (and that the 940 used to come with), and that would be a much better clip for this knife. As it is, in addition to the paint chipping, the pocket clip is just too big and clunky for this otherwise slim and svelte pocket knife. The pocket clip is reversible for left- or right-handed people, and holds the knife in a tip-up position. The 940 features Benchmade’s AXIS locking mechanism with an ambidextrous dual thumb-stud opener, but I’ve found that the best way to open the knife is to just pull back on the locking handle and either let gravity do its thing or give the knife a quick flip for fast, easy, one-handed deployment. The AXIS locking mechanism locks the knife up solid, but it is still easy to close one-handed. What I really love about the 940 is its perfectly balanced design. The length, width and weight are all perfect for everyday use, and I do mean everyday use. I have used this knife to cut everything from hemp and nylon rope to aluminum, and the knife has never failed me. I have used it to slice through thick plastic, to puncture a car hood (on a dare), and to open packages in the office. The 940 has been with me on numerous camping and hunting trips, and has been used for cutting wood for kindling, chef’s duties (this thing cuts onions almost paper thin), slicing steak, and slicing open a deer to field dress it. 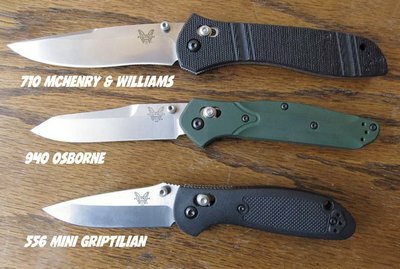 In terms of size the 940 Osborne is somewhere in between the excellent 710 McHenry & Williams and the smaller but equally impressive 556 Mini Griptilian. There is one drawback to the knife as it comes from the factory: the pivot screw is engineered to very exacting dimensions, but works its way loose after a hundred or so open and close cycles. I worked around this by taking off the pivot screw, dropping a few drops of Loctite on the screw, and then carefully replacing the screw. Since then, the knife has shown absolutely no vertical or horizontal play at all, even when I work hard at trying to get it to wobble. The blade on the knife is pretty strong, but I have seen the tip break. A fairly muscular friend was using the knife to pry open a stuck car door, and the tip broke off. Benchmade, to their credit, replaced his knife free of charge, proving beyond a shadow of a doubt that Benchmade stands by their products. Next, the anodized aluminum handles are very grippy, making the knife easy to keep hold of when you are using it for heavy-duty cutting or slicing. It would be nice if the jimping on the top and bottom of the handle and top of the blade were better, especially when you need to choke up on the knife, but I’ve yet to see this knife slip from my grip. The only complaint some might have about the knife is the all-metal construction, especially in northern regions—it does get cold if you find yourself using it in wintertime without gloves on. So, there you have it. The Benchmade 940 is one of the best pocket knives available, and is very well suited for EDC and everyday usage. Mine has been through muck and grime, sand and snow, and even for a dip in the ocean, and it has held out through thick and thin. It is not perfect, of course, but it is darned near close to perfect. 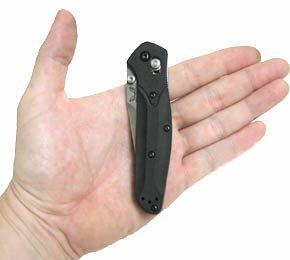 My last complaint about the Benchmade 940 is almost tongue-in-cheek; I wish the knife was a bit less expensive, so I could justify owning a couple of them! With that said, it is definitely worth the price point and beats out all of the competition within that same price range. Close to perfection, the Benchmade 940 Osborne is one of our favorite EDC knives, if a little pricey. Close to ultimate for a lightweight, tactical EDC.